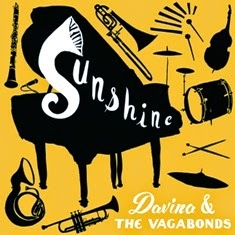 MINNEAPOLIS, MN – Twin-Cities based Davina and the Vagabonds announce a July 15 release date for their new CD, Sunshine, on Roustabout Records, distributed nationally by Burnside Distribution. Sunshine was produced by the band, recorded and mixed in December, 2013, at The Pearl Recording Studio in Minneapolis and mastered at Treelady Studios. Recorded in exquisite analog sound and set for release on both CD and vinyl, Sunshine is a bold statement from a songwriter and band that draws from the last 100 years of American music and sounds truly original. Through the 11 songs (and one bonus track), many facets of the group are represented: there is the unmitigated optimism of the title track and “Flow,” and the irrepressible New Orleans second-line groove of “Red Shoes.” “You Better Start Praying” sounds as if it came from The Band’s Last Waltz album sessions, and “Away from Me” is soul balladry at its most heartbreaking. “Fizzle Out” is an achingly beautiful pop tune, and “I Really Try to Be Good” is a hypnotic minor-key rumba. The relaxed swing of “Throw It to the Wolves for Love” is a nod to Fats Waller, and then the band covers the immortal Fats, himself, with a glorious take of his “You Must be Losing Your Mind.” Besides the Waller tune, DATV has added two additional covers that have also become fan favorites, done Vagabond style. Included is the blues tune, “I’d Rather Drink Muddy Water,” (inspired by Aretha Franklin’s version); and Davina plays a sublime solo version of Patty Griffin’s “Heavenly Day.” The album closes with the bonus track, an updated version of Davina Sowers’ “Under Lock and Key,” the title track from DATV’s 2007 album (now out of print). Over the last nine years, Davina and the Vagabonds have grown from a down-and-dirty blues band into one of the most exciting acoustic ensembles in the country. This high-energy quintet has established itself with a stellar live show, great stage presence and good old-fashioned hard work: they used to average over 300 shows a year in the Twin Cities area, and now have an ambitious full-time U.S. and international schedule. Davina and the Vagabonds' first album in three years, Sunshine is the latest chapter in DATV's new spin on an old sound mission! DATV’s last release, 2011’s Black Cloud, was the first to feature all original songs by Davina Sowers. It received 3 ½ stars in Downbeat magazine, and was named one of the Top Ten records of the year by the Minneapolis Star Tribune. The national exposure led to additional touring: several festival appearances throughout the U.S. and Europe, including appearances at the 2012 New Orleans Jazz and Heritage Festival and 2013 Monterey Jazz Festival. Over the last 3 years, the band has appeared in 38 states, two Canadian provinces, and 8 European countries. The grueling tour schedule has led to a number of personnel changes, which delayed the writing and recording of new material. After a number of changes, DATV’s Black Cloud tour has resulted in Sunshine! Davina and the Vagabonds are booked by Intrepid Artists International (www.intrepidartists.com). For more information, visit www.davinaandthevagabonds.com.